You're driving along, craving a salty snack or sweet candy. You're in the mood for a cup of coffee ... or maybe an ice cold beverage. S-L-O-W D-O-W-N and "Take a Brake from the Race" at Pit Stop Convenience Stores! 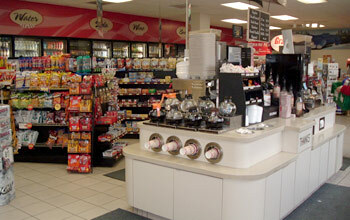 Pit Stops are convenience stores that range from your neighborhood store to mini markets to quick-serve restaurants. You'll find everything from today's paper to the newest snack and drink products on the market. Most Pit Stops sell Exxon branded fuel — so you can fill your tank and your belly in the same trip! Oh ... and when you "gotta go," you'll be glad to know our restrooms are spotless! Our friendly, ready-to-help sales associates will get you what you need with a smile, to get you back in the race as quickly as possible. It's all about EARNING FREE STUFF! Questions? Comments? Drop us a line! Click here.